There is always a question on the mind of people during summer holidays. “How best can students spend their time?” SQI has however provided an answer this time. It is really exciting. We are putting students’ writing skills to work. Nations have risen and nations have fallen apart, all in accordance with how the citizens of these nations relate with the constituted laws. As against the forthcoming 57th independence anniversary of this great nation; Nigeria; on October 1st, Speak Quill Initiative welcomes essay contributions from all young people who are not only the determining factor of Nigeria’s future but are also actors in the Nigerian project. Secondary school students from all parts of the country are hereby invited to utilize this platform to project their opinions on how the laws of a nation can either influence its growth and development or otherwise. *Write and submit an essay between 320 to 500 words on the theme. 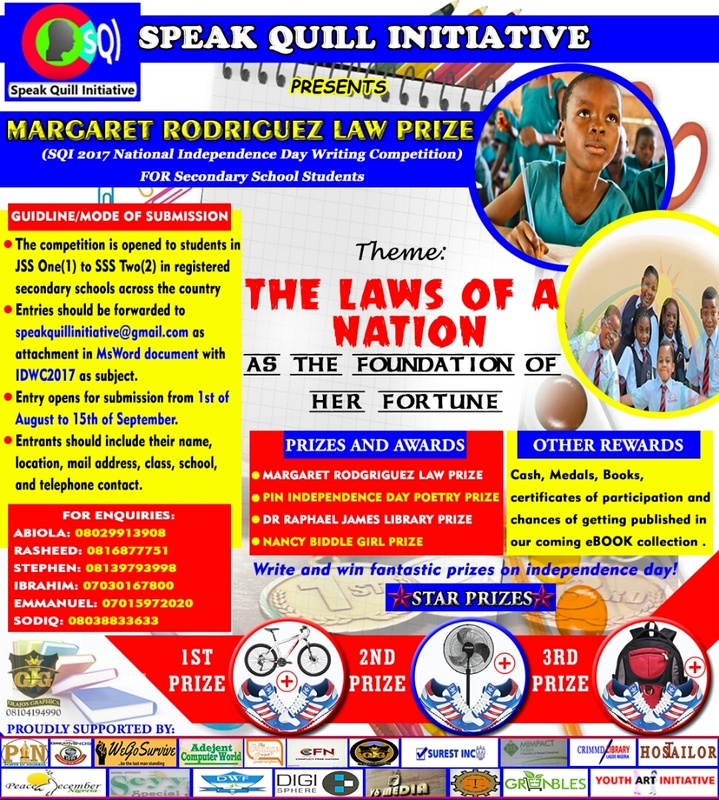 *The competition is open to students in JSS One(1) to SSS Two(2) in registered secondary schools across the country. *Entries should be forwarded to speakquillinitiative@gmail.com as attachment in *MsWord document with IDWC2017 as subject. *Entry opens for submission from 1st of August to 15th of September. *Entrants should include a cover page containing their name, location, mail address, class, school and telephone contact. …and load of gifts to go home with. PS: Parents, Guardians and Teachers can help forward for maximum broadcast.